Cyclamen (persicum) is native to the Mediterranean and North Africa. It can be grown outside in climates that do not drop below 50° F. In these climates the plant will bloom in late winter or early spring. C. persicum, also referred to the Florist’s Cyclamen, is grown as a houseplant in less hardy zones. It has sweet scented small (1/2 to 3/4 inch) flowers that are produced on long stems, held upright above heart shaped leaves. Florist cyclamen are available in shades of pink, red or white. Even the foliage is attractive, often having silver marbling on the top sides of the leaves. The entire plant, when in flower, reaches only about 8 inches high. 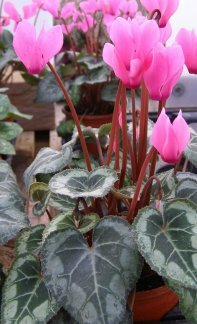 Cyclamen are usually forced into bloom for houseplant use sometime around the holiday season into late winter. Potting Soil: Cyclamen does best planted in a soil-based potting mix, with the top of the tuber just slightly above the soil line. Water: Water whenever the soil feels dry. Avoid getting water on the crown of the plant. High humidity, especially during winter, is crucial. Keep the cyclamen on a tray of water with a layer of pebbles or something else to form a shelf for the cyclamen pot to sit on. Do not let the cyclamen itself sit in the water. Fertilizer: Feed with a low-nitrogen fertilizer every couple of weeks. Light: Give cyclamen bright, indirect light. Cyclamen do not like heat, but they are not frost hardy. Do not expose to temperatures below 50 degrees F. Avoid drafts as well as hot, dry air.